I tried growing tomatoes last summer. The plants too quickly outgrew their pot (I admit I'd been stingy on their living quarters), and while they tried valiantly to deliver up a couple of red goodies, one couldn't call the first try a success. 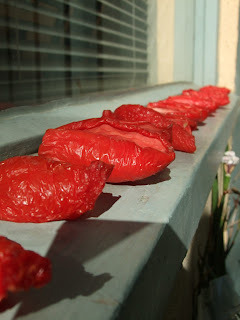 Later that summer, I heard Rosa Mitchell, chef at Journal Canteen, talking about making sun-dried tomatoes, something she does every year. 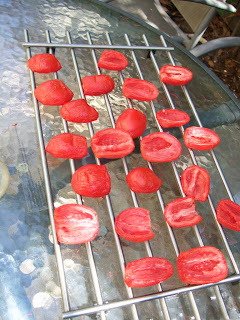 Simply put, one cuts the tomatoes in half, removes the seeds, sprinkles them with salt, then lays them out in the sun for a few days. And it is that simple. For three days I trotted out into the garden every half an hour or so to move them in alignment with the sun. 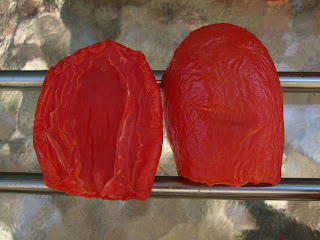 It didn't take too long for the sun's effect to become obvious, the skins to wrinkle and the tomatoes to start to pucker as they dried out. By the second day the smaller ones looked exactly like...well, the ones you'd buy in a shop. By the third day they'd all shrivelled and darkened, and a quick taste-test revealed they were bursting with concentrated tomato flavour. This to me is the best kind of 'cooking'. It requires very little skill and even less equipment. What it does need is a good dash of time and a pinch of patience. But these are the ingredients I most like to bring to my food, to create things that use a bit of a nature and that are enhanced by the seasons.